The SureGro Pre-Seeded Mats are a perfect solution for window gardens and any tray-based plant concepts. These mats can be pre-seeded with edibles, ornamentals or practicals. They are made of organic biostrate and can be configured with plant nutrients as well. The seeds are adhered to the surface of the mat and it typically comes with a matching tray. Common sizes are 10x20”, 5x10” and 5x5”. Just add water and start growing! SureGro Pre-Seeded Mats are 100% organic. 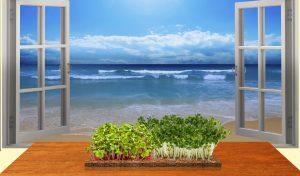 SureGro Pre-Seeded Mats bring “Just-Add-Water/Guaranteed-to-Grow” ease and convenience to window gardens of all sorts. Perfect for easy-to-grow garden kits for children, window gardens, including Cat Mats, Wheatrass, MicroGreens, Baby Greens and many other creative possibilities. Choose from our pre-designed solutions or design your own. Schedule a consultation with Seed Consultant today!